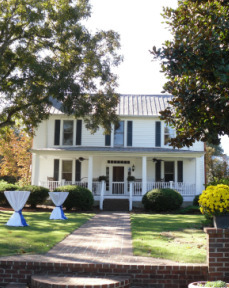 The Corry House, a historic home near Union Point and located on the Ogeechee Plantation is an event facility for weddings, parties and entertainment. The house is located approximately three miles east of Union Point and was built in the 1860’s. The house is named after the family who settled on this plantation in 1798. Since that time, ten generations of the Corry family have made this land their home. The home sits on an expanse of five hundred acres named Ogeechee Plantation in Greene County. The Ogeechee River, which has headwaters in Union Point, runs through the acreage. The home was actually built by a Confederate soldier for his betrothed after returning home from the Civil War. Ogeechee Plantation was once a cotton plantation and later was used for farming and forestry. The Corry House offers unlimited parking, privacy, and beauty. Events may be held inside the home or on the expansive lawns, gardens or under the live oaks. There is also a gazebo for outdoor weddings and events. New this year is the magical, one of a kind, forest site. Erin Porter, event planner and director states, “We want to offer a beautiful setting with reasonable prices. We have a varying array of services which would allow a group flexability and convenience. For instance upon renting the Corry House, a bride can have access to the home the entire day for decorating and set up, or we can handle all the details for her.” There is even a discount for “local brides”. Owners Bo and Ruby Cheves are excited to bring this business to Union Point and Greene County.